21 people died and nearly as many are reported injured after a boat, overloaded with tourists, capsized in the Krishna River, about 15 miles from the city of Vijaywada in Andhra Pradesh on Sunday. Krishna River boat tragedy survivors said they asked for life jackets when the boat ride began. A government official argues on camera with the driver of a commercial boat against taking passengers onto the River Krishna. The official warns that the boat did not have clearance to operate. Agitated, he pleads and warns that passengers must not be allowed on the boat and that other boats were available to ferry them. Who shot the video of Malleswara Rao is not clear but it proves that at least one government official tried to protect the safety of passengers. Why his instructions were overruled is not clear. 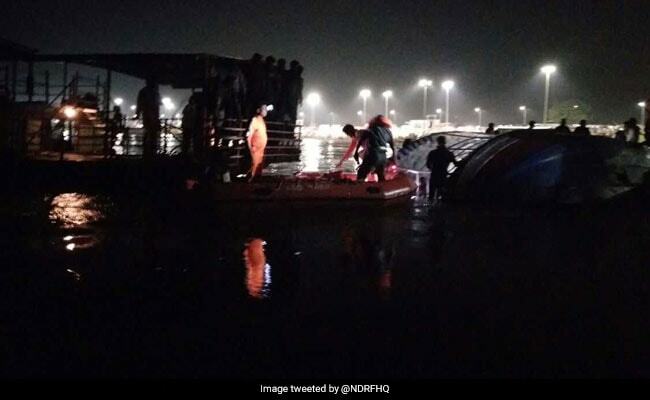 Hours later, last evening, the same boat capsized 21 people died and nearly as many are reported injured in the accident that took place about 15 miles from the city of Vijaywada. The boat's operator, a private firm, did not have the necessary permission to ferry people, said district administrative chief B. Lakshmikantham. Repairs on the boat had just been completed and the journey that turned into a disaster should have been treated as a trial run without passengers on board, said investigators. The boat in Andhra Pradesh was overloaded with tourists. The driver was inexperienced did not have a map for the journey he was making to a spot about 12 km away where the rivers Krishna and Godavari meet; the confluence is marked by a breath-taking aarti or mid-river prayer ceremony. Survivors of the tragedy, many of whom were rescued by fishermen, said that when the boat ride began, they asked for life jackets but were told by the driver that this stretch did not merit the precaution. The bureaucrat who tried to stop the boat is from the tourism department. Investigators are now trying to find out if any of his seniors had played a role in enabling the boat to operate. There are conflicting reports on what caused the boat to capsize. One survivor said that as the boat took a turn, the plastic chairs that were being used by all passengers slid to one side and the boat tilted over till the driver lost balance. Investigators said that passengers stood up for a better view of the aarti and the driver was unable to keep the boat from toppling over. A survivor named Lakshmi said she couldn't breathe or see anything under water, the boat was on top of passengers like her. "It's a miracle I was pulled out alive," she said. Sources say the private boat service was owned secretly and in part by tourism department officials which may explain why it was allowed onto the river.